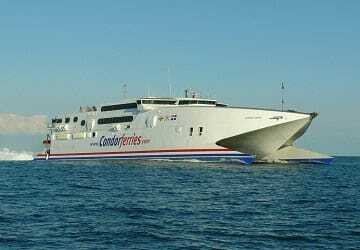 The high speed fast ferry Condor Rapide operates between the Channel Islands of Jersey and Guernsey and St Malo in France and carry up to 741 passengers and 175 cars. 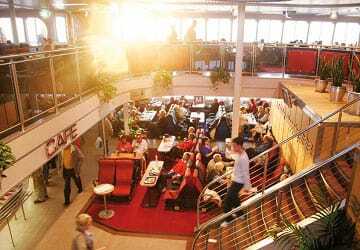 Onboard facilities include spacious lounges, a café, bar, duty free shop and a children’s TV area. 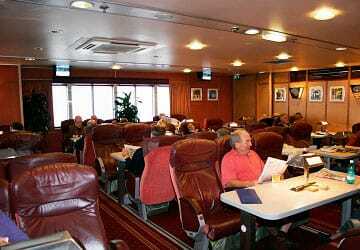 There are no cabins onboard however comfortable, guaranteed, pre-assigned seating is provided on all sailings with a choice of lower or upper deck seating. For a bit of extra luxury and affordable comfort, book a Condor Ferries club class seat. These seats are in a private lounge area featuring tables for work or relaxation, a steward service, complimentary newspapers and a selection of snacks and hot drinks. All seating areas onboard the Condor Rapide provides good access to all the facilities. 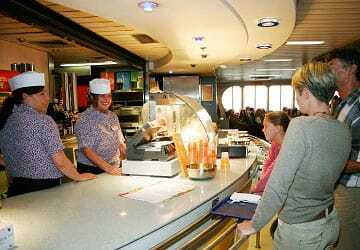 Onboard the Condor Rapide you’ll find a high quality cafeteria-style menu with a great choice and value on every sailing. Menu features a range of hot meals and snack including a wide selection of filled baguettes and sandwiches, hot and cold breakfasts, healthy salads, a choice of tempting desserts as well as a good selection of hot and cold drinks. 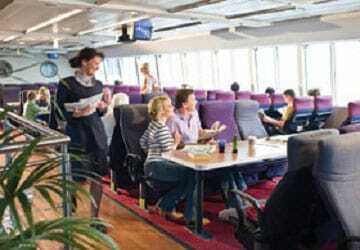 The Condor Traveller bar and shop is located on the upper deck and features a wide selection of soft drinks, alcoholic drinks including wine and beer. Children can enjoy the viewing deck where they can watch the ferry pull away and make its onward journey. There is also a soft seated children’s area to keep them entertained throughout the journey where they can watch DVD’s. For convenient access to the onboard facilities it is advised that passengers travelling with children should request seating on the lower tier. For passengers of limited mobility, disabled elevators provide access to and from the car decks and easy-to-use internal elevators provide access to toilet facilities, baby changing and the children's room. Disabled passengers or those with reduced mobility must request seating on the Lower Tier. There are anchor points for wheelchairs and seats with flexible arm rests. Assistance is available at the port and onboard however you must inform us at the time of booking if you anticipate needing assistance when travelling with Condor Ferries. Please Note: Whilst we have taken great care in making our Condor Rapide guide as accurate as possible, onboard facilities, services and entertainment may vary depending on the date and time of year that you travel, facilities mentioned may change without notification and ferry companies reserve the right to operate vessels other than those mentioned at time of booking without prior notification. The check-in and security procedures were quick and easy, the terminal had a pleasant feel about it and the crossing itself was smooth and on time, both departing and arriving. The food on-board was excellent as well! "St hellier to san malo"
We crossed from Jersey to St Malo and back a day later. Excellent and efficient service. Would be fabby if Jersey upgraded cafe services a wee bit but perfectly adequate. "The making of a lovely day trip"
Everything worked as expected with check-in being efficient, transfer to ship, welcome in Club Lounge, refreshment quality and availability could not be any better. So on the way out from Jersey we go through all Manor of searches and scanners. Very thorough in all aspects of security. Coming back nil nada nothing anyone could have boarded that ship. In these days of high security French must up their game. Excellent service on time friendly staff. Really pleased with the service provided by condor ferries - full English was lovely!! Good ship and facilities for a relatively short crossing. It's a fast boat so calm seas provide the best crossing experience. Seats were comfortable.